Although Frankie is hurt and confused when his two mommies separate, he is comforted by knowing that Patty will still be part of his life. 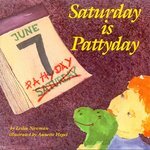 Newman, Lesléa, "Saturday is Pattyday" (1993). DIVerse Families. 370.